Welcome to Hoyle Law, LLC. As the founder of this firm, I want you to know that we value the opportunity to serve your legal needs and hope that this is the start of a long relationship. 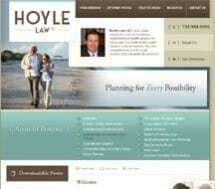 Hoyle Law is located in the revitalized downtown of Asbury Park, on the ground floor of 700 Mattison Avenue. Our team is service-oriented and highly knowledgeable, and our office is fully automated with time-saving technology that ensures every detail is attended to. I have practiced as a lawyer in Monmouth County, New Jersey since 1995. Prior to creating Hoyle Law, I was a partner in a general law practice in Matawan, handling all probate, chancery and elder law matters. I established this practice with the objective of becoming a quality law firm serving the Monmouth County area in guardianships, estates and elder law. Unlike larger firms that depend upon high volume, we can provide truly personalized attention and take the time to fully address your needs. We walk clients through the entire planning process, making sure that every contingency is covered regarding power of attorney, appointment of guardians, a living will, nursing home care, and providing for vulnerable family members. See our downloadable questionnaires to help prepare for the process. In addition to 12 years of experience, I am a New Jersey Superior Court-certified mediator and a Certified Master Guardian by the Center for Guardianship Certification, frequently chosen by area judges to represent those without close family. I am also active in the community, currently serving as Councilman and Chairman of the Public Safety Committee for the Borough of Interlaken.